Born Hugo Alvar Henrik Aalto (February 3, 1898 - May 11, 1976) in Kuortane, Finland, was noted for his humanistic approach to modernism. He studied architecture at the Helsinki University of Technology from 1916 to 1921. In 1924 he married architect Aino Marsio. 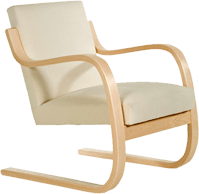 Alvar Aalto was one of the first and most influential architects of the Scandinavian modern movement, and a member of the Congres Internationaux d'Architecture Moderne. Major architectural works include the Finlandia Hall in Helsinki, Finland, and the campus of Helsinki University of Technology.